When I moved to Ireland for a year in 1997, I had one cookbook with me. It was an impulse purchase I had made about two weeks before leaving, and although I hadn’t intended to sacrifice any of my precious luggage allowance to something as frivolous as a cookbook, this particular one seemed to hold me under a spell. It was Kitty Morse’s North Africa: The Vegetarian Table, the first full-price hardback I’d ever bought, cookbooks in those days representing a major financial investment for a starving college student. Although I had amassed quite a collection of cookbooks at home over the years – most of them slim limited-focus volumes I’d found on the bargain table with titles like Philadelphia Cream Cheese Classic Recipes, The Taming of Tofu, or Brownies: Over One Hundred Scrumptious Recipes for More Kinds Than You Ever Dreamed Of* – none of them were close enough to my heart to consider stashing in my bags when I traversed continents. This one, however, was different. It was a beautiful book of coffee-table quality, with luscious photographs and glossy, elegant print. I kept it on my bedside table in my bleak Trinity College dorm room, and often picked it up to look at the pictures of gilded platters overflowing with jeweled couscous and honeyed tagines. They transported me away from the incessant rain pounding outside my window and took me to sunny places where the scent of woodfires and spices drifted lazily on the breeze, and where vegetarian cooking was exciting and exotic (and didn’t necessarily involve sprouted wheat and soy protein). In addition, whereas all the cookbooks I’d acquired up to that point were just about recipes and exploring slightly different ways to use familiar ingredients, this one was as much about people, culture and geography as it was about food. The only problem was that I had never managed to actually cook anything from it. Despite the fact that I drooled over every recipe and laid out dinner plans in my head that included a feast of luscious North African delicacies, the logistics of the recipes intimidated me – these dishes, as much as I wanted to eat them, were outside my comfort zone and I didn’t even know where to go to find the more exotic ingredients they called for. I was also, I think, secretly afraid of being disappointed, of realizing that this beautiful, mysterious food was not that spectacular after all. Whatever the reason, the book lay there, dog-eared from reading but unused in the kitchen. About this time I also started dating a guy I had met in Dublin. He had a wonderful Irish accent, but apart from that I can’t quite recall what the attraction was. It certainly wasn’t culinary – this guy had been raised on his mother’s lumpy potatoes and boiled beef and tended to eye anything that hadn’t been mashed, boiled or deep-fried with no small amount of skepticism. I didn’t realize how deep our differences ran, however, until the night I convinced him to accompany me to a newly-opened Indonesian restaurant. Despite the fact that I found the flavors incredibly Westernized, it took all of two bites of an elaborate rijstafel for him to decide that this alien food had no place in his stomach, and all of another minute for him to remind me that I had offered to treat him to this expensive mistake. It was a lesson learned, and should have clued me in to our long-term potential. Instead it took another couple of months of greasy, tasteless meals together before the end came, and even so it was he who dropped the bomb on me, telling me he had decided to get back together with an ex-girlfriend (who was probably as happy eating fish and chips every night as he was). Needless to say, I was heartbroken, and I moped around for days until a strange idea for redemption took shape. Out of spite as much as hunger I decided to prepare an elaborate meal I knew he would have hated – the kind of exotic, spicy, opulent food I had been denied while dating him, and I would invite all the friends I could find to share it with me. And of course it would be North African – after all, it was the only cookbook I had. I scoured the city high and low for ethnic food shops and finally found everything I needed; I set a date and invited everyone to my tiny university kitchen to share in my first nervous foray into this unknown cuisine. Luckily, I needn’t have worried – the dinner was a huge hit. From the syrupy pumpkin and prune tagine, to the assortment of hot and cold vegetable mezze to the brimming pot of fragrant couscous, everything I made was spectacular. The undisputed star of the evening, however, was something unexpected – it was a Tunisian specialty called a makhouda d’aubergine, a thick, spicy frittata oozing sweetly stewed onions, peppers and eggplant, chunky cubes of gruyère cheese and a wonderfully aromatic spice blend of cinnamon, pepper and rose petals. It was heavenly – and has been each and every one of the dozens of times I’ve made it since. Years later, my memory of that particular guy is rather hazy; the memory of that meal, however, is still crystal-clear. And to be honest, I’m much happier having the makhouda around instead of him. Notes: Serve this as a side dish with sweet or savory tagines, or as a light main course with a fresh green salad. Tunisians also apparently love to stick slices of it inside crusty bread spread with a little harissa and eat it as a sandwich. 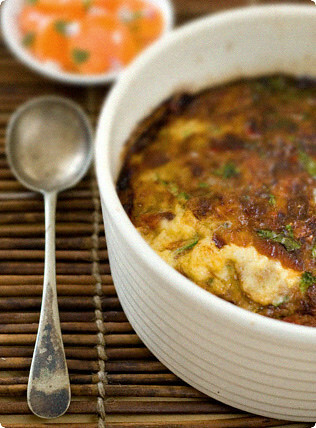 In a medium bowl, mix the eggs and add the herbs, garlic, cheese and bread crumbs. Add the eggplant mixture. Season with the bharat, salt, and a small spoonful of the optional harissa or cayenne pepper. Grease a 2-quart soufflé dish. Pour the egg mixture into the dish and bake in the middle of the oven until golden brown and puffed in the center, 40-45 minutes (a knife inserted into the center should come out clean). Let cool for 10 minutes before unmolding onto a serving platter (you can also just leave it in the dish). Cut into wedges or squares to serve. Serve hot or at room temperature with lemon wedges on the side. Strange, isn’t it- the food is consumed within minutes, while the men (or women, as the case may be) often linger through our lives for days, months, or even years. And still, at the end of it all, that fleeting bite, mere seconds of our lives, remains, and the rest just fades away. I can even remember meals cooked by men better than the men themselves, sometimes.The book sounds divine. I’ll be keeping my own eyes open for it on the discount table. I read this article with a big smile on my face from start to finish. I enjoyed it so much.I can relate to your feeling re: your ex-boyfriend. I’m a moroccan born, french raised and married to a pure whool canadian. My family in law often ask me to "please, cook something normal for once", not realizing their norms are very different than mine :-))I didn’t know Makhouda. I know very little about tunisian cuisine. Certainly a fine recipe to try soon.I never thought about north-african vegetarian cooking the way you think about it. I can’t agree more with your thoughts about it.Thank you for (yet again) a great article and a great recipe. Very funny Melissa. I once had a boyfriend too who was just waiting for me to finish my plate so that in case of leftovers, he woulld gulp them down, and I thought "this is just not right". Sharing food interests is so key! (I am lucky, I got an Irish one who is beyond potatoes! 😉 I have at least 4 North African cookbooks and I had not heard about this dish, so I will try it for sure! Love the contrast of the orange in the back of the picture! It’s nice to know that good things come from bad dates. Will keep that in mind…for the future. That sounds divine and what a great story to go with it.Now to hunt for the ingredients. Ijust wanted to add, about Kitty Morse. As far as I know, she probably is the chef-writer who is the most loyal to North African cuisine authenticity. hi melissa, beautifully evocative prose and picture, as always. a couple of cheap as chips penguin cookery paperbacks on my bedside table saw me through those endlessly looming essay deadlines and dreary hall dinners in my college years, and one of them was claudia roden’s new book of middle eastern food – i must have cooked my way through every single kuku and eggah recipe of hers! As all of the others, I really enjoyed reading your post. (and quietly envy your super way with words, :))I love North African quisine, just started with it more often recently. Your recipe sounds nice, I will be making it tomorrow with a classic Morrocan Chicken Tagine.Where did you get that old-looking spoon? It looks so right for the meal. Brilliant post! I so know what you mean. While married, I hardly cooked any fish dishes because my husband hated fish and would sulk if I served it to others if he was part of the dinner party. The first two weeks I was free, I ate fish every single day! I love the look of this dish and am always on the look out for vegetarian dishes because a good friend is one. Thanks for a lovely post & recipe! Brava, Melissa!Isn’t it interesting how intertwined food and love are … I guess it’s true what the say … revenge is a dish best served cold (or however you choose)!You’ve made that cookbook come to life. I shall keep my eyes open for it. I love your story, Melissa. I’m fortunate enough to be able to share all my food experiences with my husband. I’ve never tried African food tho’. Hi Melissa,What a wonderful story. It’s always a pleasure to visit because every dish you prepare has some sort of meaning for you. The photography is excellent, as always! What an interesting post! And this dish sounds really exotic. As always, great photo! lovely food writing. i got to style (food style) Morse’s book called Couscous, and enjoyed making all of the recipes. i’m not a big fan of the red pepper in general, but when cooked in this sort of thing, sometimes i do like it. do you know the red pepper spread called Muhumara? made with toated pine nuts, walnuts or almonds? if not, i think you’d really like it. Manuel must be very pleased that your ex didn’t share your culinary passions:) Great story, and the recipe sounds very tempting. I agree with Dreska – that spoon suits the dish so well! Eggplant and gruyere? How can I resist? Sounds like you had a fabulous "post-breakup" meal. What a way to lift the spirits again huh! Im glad Manuel is such a great culinary partner in crime for you, he’s a lucky man to be able to eat all these wonderful things you make! Hi Melissa, how are you?I can’t imagine living with a meat-and-potatos-only kind of man.No, no, and yet again no! Can you imagine never being able to share something fascinating with a man you love (yeah, Melissa, I know you can)…. I can’t.I don’t think I’d be into the makouda as I’m not too fond of eggplant, but I think it’ll work just as well with zucchini (would it? ).I’ve heard about rijstaffel, and it sounds utterly scrumptious. hmmm you’re talking about your days in college, and I just got back from shopping for Frushi (Friday Sushi)… see, I teach salsa at a club in the Hebrew University on Mount Scopus here in Jerusalem. I’m part of a crew – and one of the instructors, Doron, has this tradition in which every Friday away from home, he invites friends over for sushi. All of us except for me are University students. So in this labyrinth of buildings known as the Idelson Dorms, we meet tonight to cook with friends. I’m in charge of the miso soup and the sushi rice, and he takes care of the rest. Others will bring the wine and the company. :-)Interesting things happen with young people! Hi Melissa What a wonderful story. What a person chooses to eat is so related to their type of personality. I have dated a couple of guys who have had the worst taste in food needless to say the relationships never lasted. I am now married to a wonderful man who shares my passion. Melissa, I enjoyed reading your post. Love is inevitably intertwined with food! I was planning on buying a North African cookbook, now I know which one. Thanks! hey melissa. loved that photo of the dish. I simply love aubegines in any form. I’m a fellow food blogger from Singapore. I added your blog as a link to mine, I hope you don’t mind. Great blogging! Hi Maya – Oh yes, I know what you mean! I was in Indonesia (Bali) about six years ago, and the food was a hundred times better than any Indonesian food I’d had before. In fact it was so good that I’ve never felt my own attempts did it justice, but maybe I’ll have to give it another shot.Hi GastroChick – I agree! In retrospect I realize it never could have been true love without any shared tastes.Hi Ashwini – I can highly recommend this one, and several people have commented that Kitty Morse’s other book ‘Cooking at the Kasbah’ is excellent as well. If you’d like a more anthropological approach to North African food, I can suggest Paula Wolfert’s ‘Couscous and Other Good Food from Morocco’ – it’s a classic, though some of the recipes are a little more difficult.Hi Shaz – Thank you, and I hope this has given you another aubergine dish to add to your arsenal!Hi Katy – Absolutely, and I’m starting to suspect that for anyone really passionate about food, there must be some events in their life where food and love intertwined, for better or for worse! I’ve followed your blog a while. Saw this and ment to try it. Angelika from the flyingapple.com has brought it back to may attention and we’ll be having this by Tuesday. Food is all about nourishment but not just the body. Love your blog. Thanks. How about the recipe for the pumpkin, prune tagine? Hi Tanna – thanks for your kind comment. If you’d like to send me an email I’d be happy to send you recipe for the pumpkin and prune tagine. I loved the story! and the dish sounds awesome. I’m always looking for a new version of sunday morning frittatas and this is it!Thanks for sharing. I made this dish tonight. It is wonderful. I didn’t have the bharat so I looked up a recipe for it on Arabic news. I turned out perfectly. I too would love the recipe for the Pumpkin Tagine. I have ordered the cookbook from Amazon based on your reference. I love your Blog, very well organized. wow, this sounds so good. I love eggplant. I am starting a catering business, doing what I love! To cook and eat!So I will definetely try this. i made this today and it was delicious! i live in venice and so i used squaquerone, which is a very soft cheese instead of the gruyere….i think it would also be good with ricotta! I've just made it for lunch and it is delicious! I've used simple Gouda cheese (and had maybe 150 g) because Gruyere is not available in my country. That recipe sounds delicious. I do not have all the ingredients but plan to pick them up so I can try it!